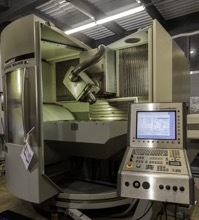 Tronos Aviation - Tronos Manufacturing incorporates 5-Axis machining capabilities. Tronos Manufacturing is pleased to announce that it has recently added 5-axis machining capabilities to our portfolio of services. We bring over 30 years of experience to Aerospace and related manufacturing industries and our machining capabilities have expanded tremendously with this acquisition. Tronos Manufacturing operates with AS9100D for both design and manufacturing standards. Complimentary to our existing CNC turning and milling capabilities, the Deckel Maho DMG-DMU 5-axis equipment provides a traverse path X axis of 34.65” (880mm), Y axis of 24.80” (630mm), and Z axis of 24.80” (630mm). Thus, allowing for capability expansion in our tool and fixture, and precision machining services. By completing this acquisition and expansion of services, Tronos continues to demonstrate our desire to provide a world class management system, while continuing to improve our products and services through organic growth.